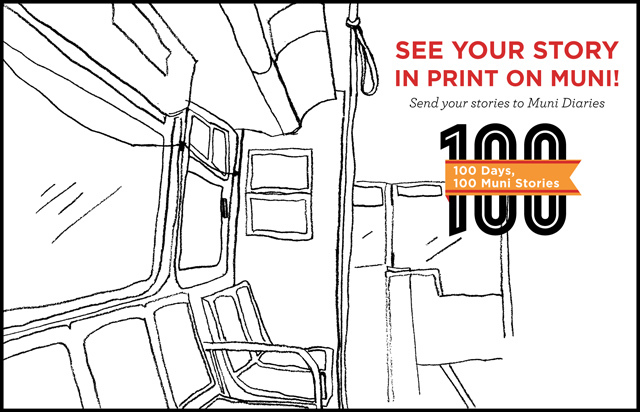 See Your Story on a Bus Ad with “100 Days, 100 Muni Stories”! Muni turns 100 this year, and we want to celebrate it with your Muni stories. After all, we think that’s the best part about riding the bus. Today we’re launching our “100 Days, 100 Muni Stories” story drive: submit a Muni story in the next 100 days and a portion of your story can end up on a bus ad! Your Muni story can be long, short, or even a funny tweet. We’ll choose two of the best stories on Muni Diaries — thanks to SFMTA’s help, portions of the winning stories will appear on advertisements inside the bus. Yes, your clever wit and your name can make an appearance on buses citywide. So tell us your best Muni stories (use the hashtag #100MuniStories)! Need inspiration? Check out our archive of favorite Muni tales. See all the centennial celebration events at SFMTA’s official Muni centennial site. Muni Diaries “100 Days, 100 Muni Stories” graphic design is by Lisa Wong Jackson. Check her out at Good on Paper.